Making Sense of News: Isn’t that what we all want to be able to do – those of use (probably a minority) who are interested in news in the first place? 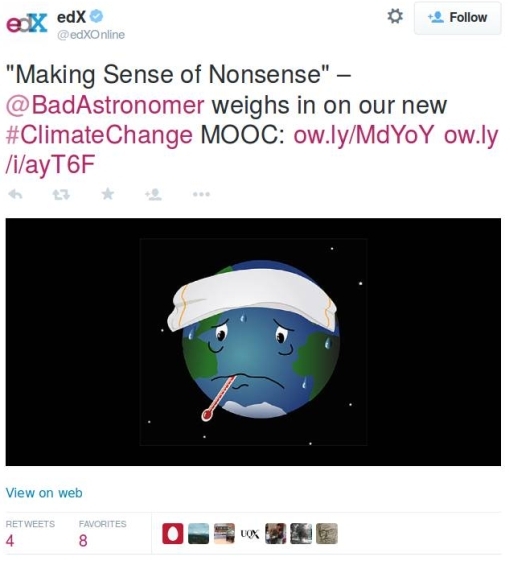 Now there’s a free MOOC (= “massive open online course”), available on the edX platform, with that title. Look closer, though: this is a MOOC with a difference. “The University of Hong Kong”! Teaching us how to “Make Sense of News”! 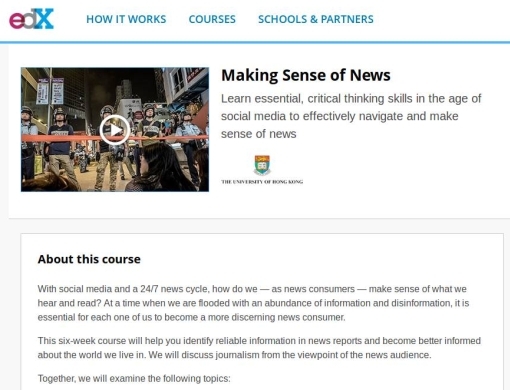 This six-week course will help you identify reliable information in news reports and become better informed about the world we live in. We will discuss journalism from the viewpoint of the news audience. Things have gone downhill from there, despite various guarantees made by China when it took back control. Dissatisfaction by Hong Kongers reached its peak with the extensive street-protests of late last year. It’s true that those were prompted mainly by violations of promised electoral law; the media there is supposedly mostly free from Mainland interference. But not this one from Hong Kong. There might be a degree of nervousness involved here from edX. Indeed, this is a MOOC one could well imagine that will be shut down before it is supposed to end, due to outside pressure. Alternatively, perhaps it is some sham MOOC that delivers People’s Republic-approved pablum that really doesn’t help anyone to move beyond the restricted approach to gathering news that Peking prefers its citizens to take – but I really doubt that, it doesn’t make sense, and for me edX is much too credible a platform to allow that. “Making Sense of News” must be legit. Will it be accessible through the Great Firewall? Will it even be accessible to those in Hong Kong? Stay tuned. I’m signed up. You can be, too. UPDATE: Uh-oh, trouble already, and the course hasn’t even started! What has happened is that the course instructors have issued a couple of e-mails with links to a number of video-previews, to give a foretaste of the lectures. After sending the e-mail with the course outline yesterday, we’ve received a few inquiries about the preview clips on YouTube from China where the video streaming platform is not accessible. Please rest assured that this only affects the preview clips. All the actual instructional videos within the course should play back smoothly no matter which country you are from. “[S]hould play back smoothly.” We can only hope so.